I have sold a property at 401 2165 40TH AVE W in Vancouver. Residential property sales in the region totalled 2,233 in October 2016, a 38.8 percent decrease from the 3,646 sales recorded in October 2015 and a 0.9 percent decrease compared to September 2016 when 2,253 homes sold. Last month’s sales were 15 percent below the 10-year October sales average. New listings for detached, attached and apartment properties in Metro Vancouver totalled 3,981 in October 2016. This represents a decrease of 3.5 percent compared to the 4,126 units listed in October 2015 and a 17 percent decrease compared to September 2016 when 4,799 properties were listed. Last month’s new listing count was 9.5 percent below the region’s 10-year new listing average for the month. The total number of properties currently listed for sale on the MLS® system in Metro Vancouver is 9,143, a 4.5 percent decrease compared to October 2015 (9,569) and a 2.3 percent decrease compared to September 2016 (9,354). 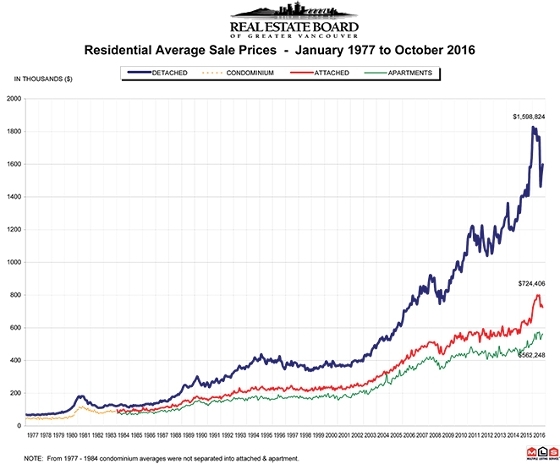 The sales-to-active listings ratio for October 2016 is 24.4 percent. Generally, analysts say that downward pressure on home prices occurs when the ratio dips below the 12 per cent mark for a sustained period, while home prices often experience upward pressure when it surpasses 20 percent over several months. The MLS® Home Price Index composite benchmark price for all residential properties in Metro Vancouver is currently $919,300. This represents a 24.8 percent increase compared to October 2015 and a 0.8 percent decline compared to September 2016. Sales of detached properties in October 2016 reached 652, a decrease of 54.6 percent from the 1,437 detached sales recorded in October 2015. The benchmark price for detached properties is $1,545,800. This represents a 28.9 percent increase compared to October 2015 and a 1.4 percent decrease compared to September 2016. Sales of apartment properties reached 1,178 in October 2016, a decrease of 23.7 percent compared to the 1,543 sales in October 2015.The benchmark price of an apartment property is $512,300. This represents a 20.5 percent increase compared to October 2015 and a 0.3 per cent increase compared to September 2016. Attached property sales in October 2016 totalled 403, a decrease of 39.5 percent compared to the 666 sales in October 2015. The benchmark price of an attached unit is $669,200. This represents a 25.7 percent increase compared to October 2015 and a 1.1 per cent decrease compared to September 2016.